Here’s the original article, as published in The Sunday Times – by Tom Whipple. 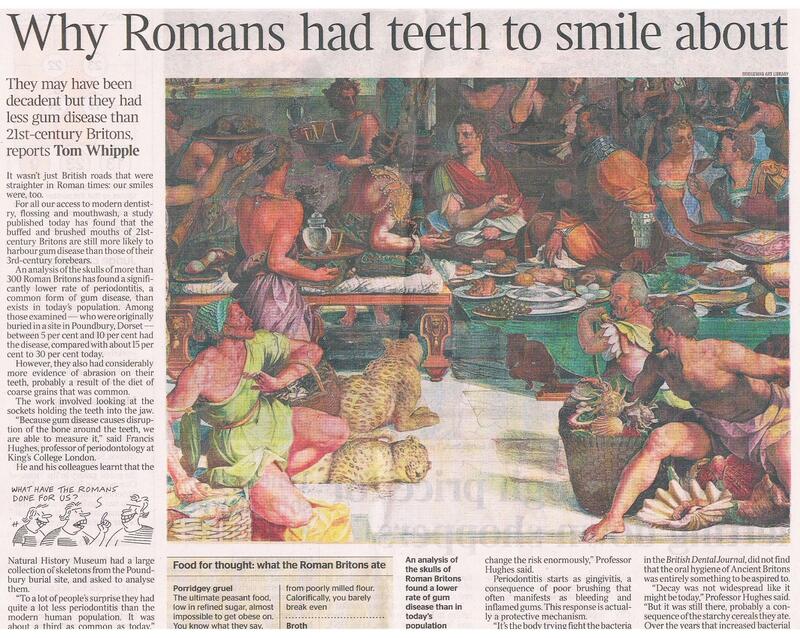 It wasn’t just British roads that were straighter in Roman times: our smiles were, too. For all our access to modern dentistry, flossing and mouthwash, a study published today has found that the buffed and brushed mouths of 21st century Britons are still more likely to harbour gum disease than those of their 3rd century forebears. An analysis of the skulls of more than 300 Roman Britons has found a significantly lower rate of periodontitis, a common form of gum disease, than exists in today’s population. Among those examined – who were originally buried in a site in Poundbury, Dorset – between 5 per cent and 10 per cent had the disease, compared with 15 per cent to 30 per cent today. However, they also had considerably more evidence of abrasion on their teeth, probably a result of the diet of coarse grains that was common. The work involved looking at the sockets holding the teeth into the jaw. “Because gum disease causes disruption of the bone around the teeth, we are able to measure it,” said Francis Hughes, professor of periodontology at King’s college London. He and his colleagues learnt that the Natural History Museum had a large collection of skeletons from the Poundbury burial site, and asked to analyse them. “To a lot of people’s surprise they had quite a lot less periodontitis than the modern human population. It was about a third as common as today,” Professor Hughes said. Some of the explanation for this does not exactly provide cause for envy: the Ancient Britons managed to contract even more serious diseases first, and died of those instead of suffering through old age with bad teeth. The most common age at death appeared to be in the 40’s. The reason for the modern mouth to be unhealthier than it was centuries ago is probably a result of two things – diabetes and smoking. “Those two change the risk enormously,” Professor Hughes said. Periodontitis starts as gingivitis, a consequence of poor brushing that often manifests as bleeding and inflamed gums. This response is actually a protective mechanism. “It’s the body trying to fight the bacteria off. In smoking and diabetes that protective mechanism is decreased – the body is less able to fight,” Professor Hughes said. With a life free not just from smoking and diabetes but also from refined sugar, the Poundbury teeth were similarly less affected by cavities. Nevertheless, the research, published in the British Dental Journal, did not find that the oral hygiene of Ancient Britons was entirely something to be aspired to. Where decay did exist, it went unchecked. Some teeth had decayed to the point where they had infected the nerve, while others caused holes down to the jaw itself. The ultimate peasant food low in refined sugar, almost impossible to get obese on, you know what they say, nothing tastes as good as thin feels. And gruel feels pretty thin. Ward off diabetes the ancient Briton way, by chewing continuously on gritty, tough and mind-numbingly tedious bread made from poorly milled flour. Calorifically, you barely break even. It might not have the richness of modern soups, but as far as your oral hygiene is concerned it will keep you smiling to the very end. If, that is, you can get over the unrelenting misery of your diet. Professor Francis Hughes’ research into the incidence of gum disease is not surprising. He found there was a much lower incidence of gum disease but a much higher incidence of tooth wear due to a much rougher diet. He then claims that this is due to two things: diabetes and smoking, but also an absence of refined sugar from the diet. I am not sure if I agree with him, because in Roman times, people’s lifespans were only about 40 years, whereas now it extends easily to twice that. So many of our patients are much older and the disease process is around for much longer so that it appears to be worse, but actually it is not. Also the Romans ate a lot of starch which breaks down to sugar and this would have caused tooth decay that he noted was present……….. And as for diabetes? Well type II diabetes, which is on the increase, usually affects people after the age of 40, so most of the Romans would have died before it took place! But what is a fact is that because we are living longer, our bodies and bodily functions start to suffer from wear and tear and we need to work harder and harder to maintain health and reduce the effects of illness. Good diet, lots of exercise, and of course, looking after our bodies better is the key to a healthy old age. As gum problems only start to become a major problem as we get older, it is even more important to ensure that we do not have any bleeding gums or other symptoms of gum disease that may compromise our general wellness.